We always want the best for our wedding, but by having the best doesn’t mean you need to spend a fortune. Yes, weddings are expensive, but it doesn’t have to be too expensive, so you can still save up for the more important things after the wedding. 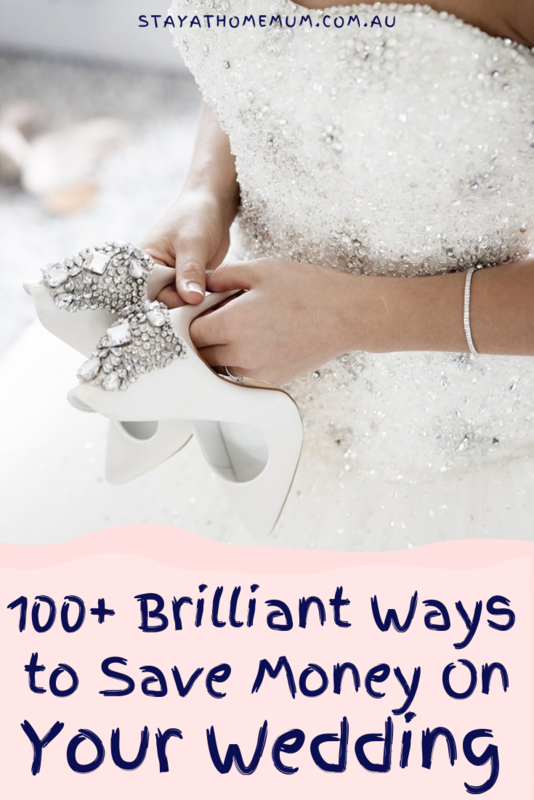 Here are 100 ways to save money on your wedding! There are many great wedding planners available, but nothing beats a good old fashioned spreadsheet. 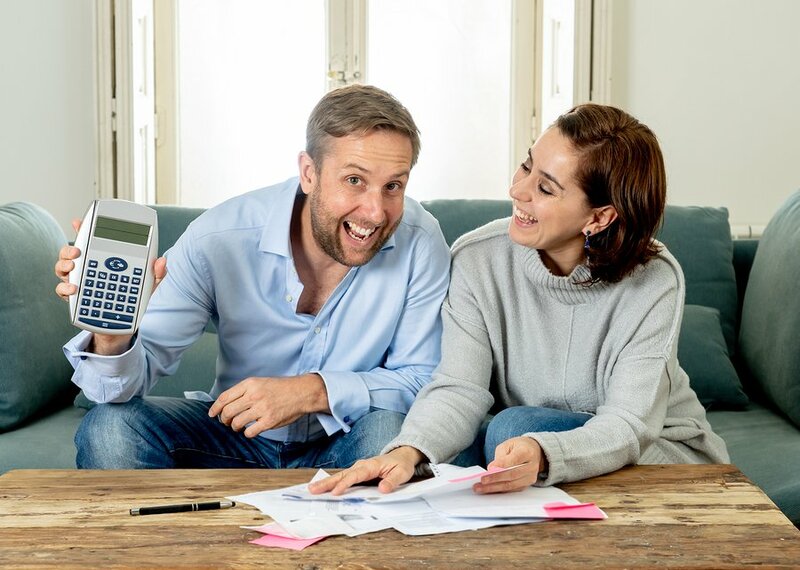 Budget how much can you spend on each aspect – and stick to it! Organisation and planning can save you a fortune! Get a friend who likes to do public speaking to be the MC for the night, and even the DJ if they are computer savvy. 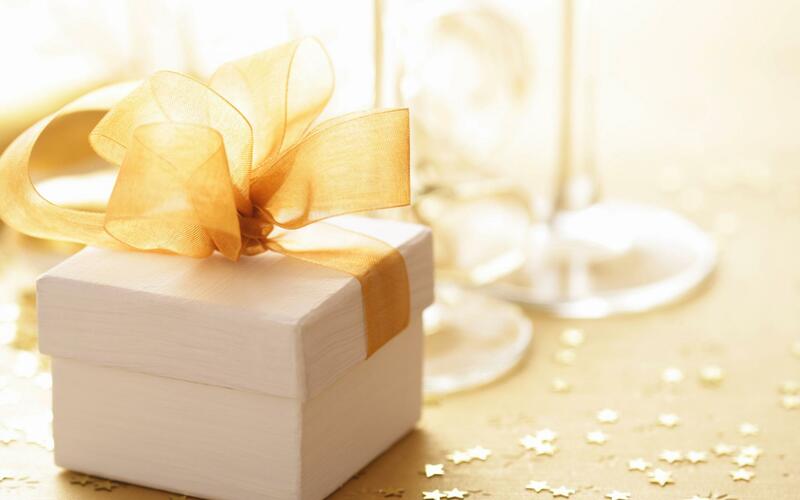 Encourage friends and family to offer their help or talents in exchange for wedding gifts. In lieu of gifts, ask your guests to contribute to your honeymoon fund. Have a longer engagement, this gives you time to grab everything you need for your perfect wedding. 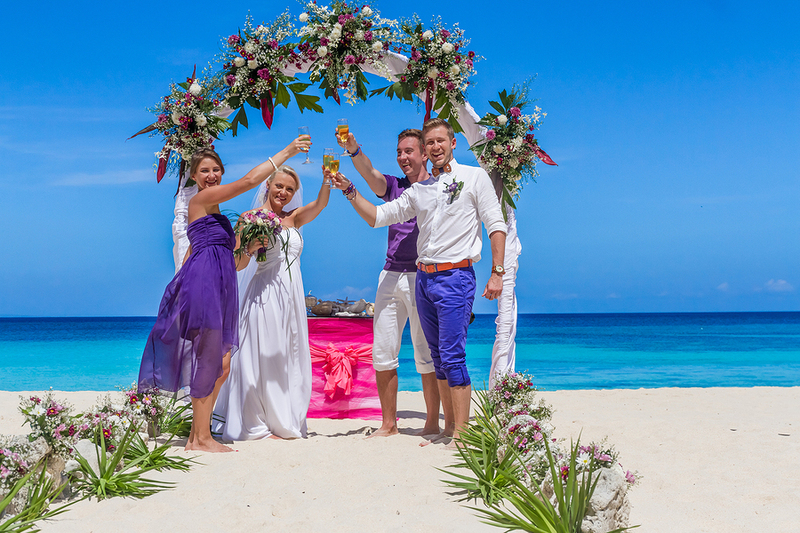 Consider booking a wedding package overseas – you can have your ceremony somewhere special and enjoy your honeymoon, then have a family barbecue to celebrate on your return. Check out discount luxury travel companies such as Bon Voyage to choose somewhere special. Only invite people you know and love. Inviting your Aunt that you haven’t seen you since you were five is just costing you a lot of money for a relationship that isn’t there. Make your wedding day special by only inviting people that are a big part of your life. If you are inviting people from out of town, include a list of all the local hotel and accommodation options including pricing. You can often negotiate a good deal this way and save money for your guests. Limit the number of partners your invite. If you have friends with partners whom you don’t know, just invite your friend to keep the list down. Sign up to multiple wedding website mailing lists. You might just find out about a great sale that will save you loads of cash. 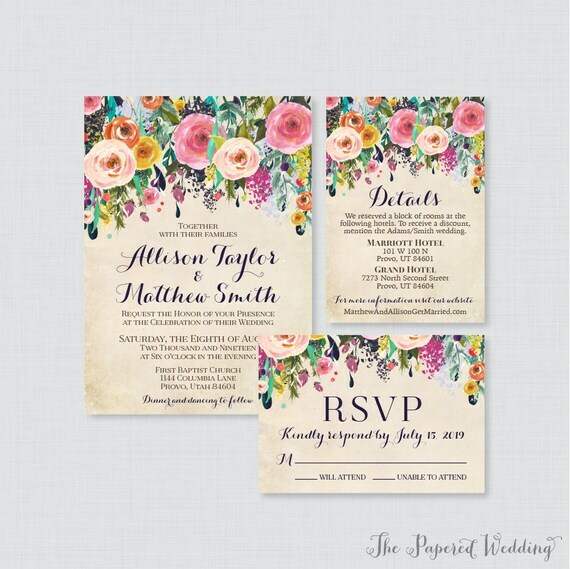 When it comes to wedding invitations, less is more! Now that the digital age is here, do you really even need to send out expensive invitations that might just end up in the bin? Do all your invitations via the internet. 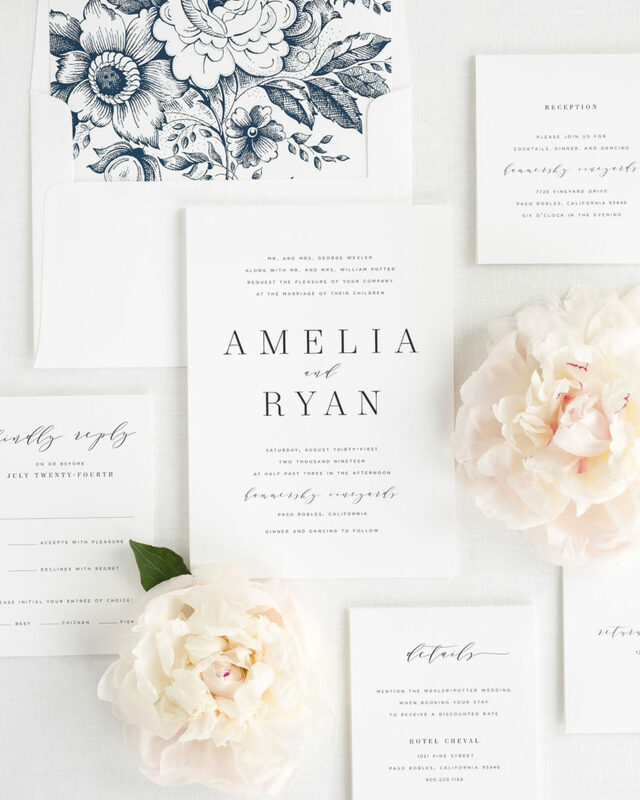 Look at places like Etsy for a good wedding invitation template – and buy your own fancy paper. Remember though, most people will throw out the invitation after the event, so only use fancy stationery for the people you know will keep it forever, and use a cheaper paper for everyone else. Many of these templates can be used digitally too! Follow up on attendance by setting up an ‘Event’ on Facebook. Invite all your bridesmaids around to do the personalised addressing of envelopes for invitations. 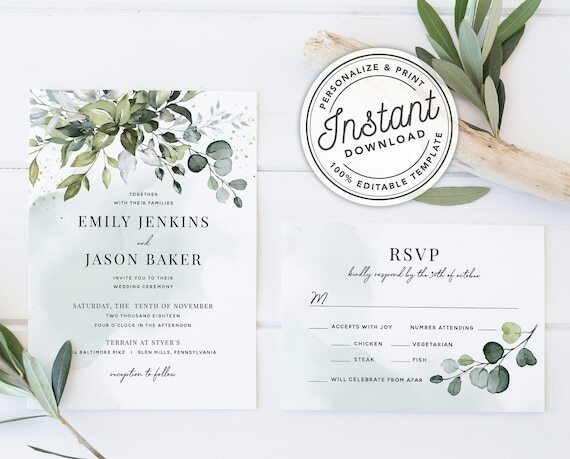 Instead of including a self-address envelope for the RSVP, set up a basic wedding website where you can have people RSVP online (or even through Facebook to keep it even cheaper!). Send a wedding e-invite rather than post out real ones! 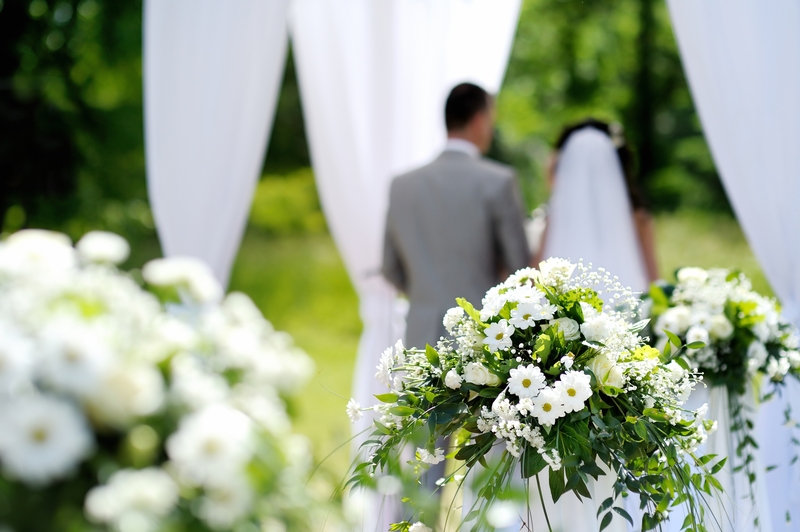 Keep your ceremony and reception venues either at the same place or within walking distance to save money on transport. Ask the venue if they have fully-inclusive wedding package deals. It is less work for you, and often you can still negotiate the price! 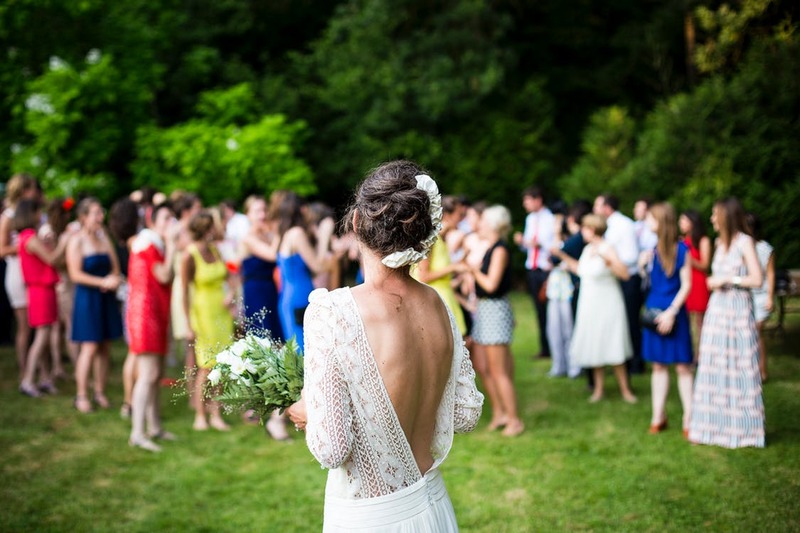 Rent a house for the ceremony and reception that can accommodate the bridal party to sleep over the night before. A beautiful roof top with a view makes for a gorgeous small wedding venue. Try AirBnB to find something really special! Get married in a park, on the beach or a public place, then have the reception in a nearby restaurant. Print a poster with the ceremony program and have it visible when people walk into your venue rather than printing one for each person. Look at having the ceremony at the local courthouse – and then have a bigger fancier reception! Have your ceremony in your backyard or a local park rather than hiring a venue. Have a breakfast ceremony or brunch. Only hire a professional photographer for a few hours rather than a whole day. Keep them local to your location, otherwise, you will be incurring their travel and accommodation costs. Ask for an all-inclusive package that allows you to keep the photography images. You can always get prints and albums later on when you afford it. 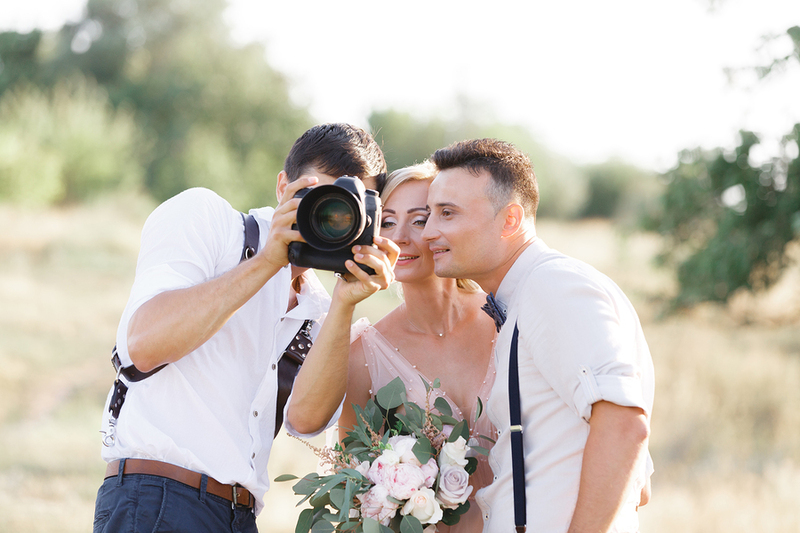 Ask a professional to do the ceremony – and perhaps look at getting a student photographer to do the reception. Find an ‘Up and Comer’ Photographer that is good, but needs a bit more experience. To keep the amount of time a photographer is attending, have a pre-meeting with all your ‘Required Shots’ eg One with just the Bride’s family etc. Limit the number of bridesmaids and groomsmen. Better again, have none! Get a friend to do your hair makeup and the bridesmaids do their own. Have the bridesmaids have their makeup done at a local makeup counter. Use costume jewellery for the bride and bridal party rather than the real thing. 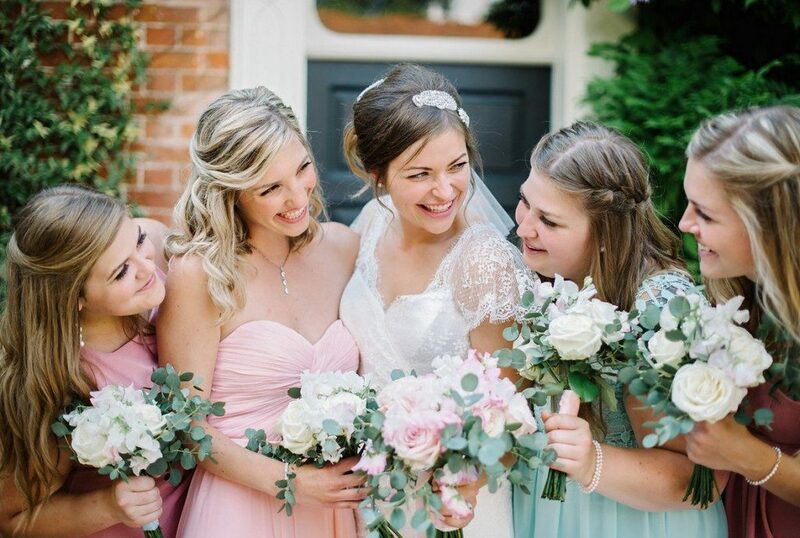 Rather than having your bridesmaids in matching dresses, choose a colour and let them buy whatever they like in that colour! That way the dresses will suit the bridesmaids, and they are more likely to use them again (you need to consider their costs too!). Buy a pre-owned wedding dress. After all, it has only been worn once. Don’t have bouquets for the bridesmaids, instead have them carry a single flower or basket of petals. If you have your heart set on a dress but can’t afford the price tag, why not see if you can hire it instead! Kennedy Blue are located in the United States and produce high quality designer bridesmaid dresses from $99. These are things that are just a waste of money and your wedding can survive without. Button Hole Flowers for the Men – totally unnecessary! Car Hire. Drive your own car or have a friend with a cool car donate the use in lieu of a gift. If you want some special bling for the day but can’t afford it, why not look at ‘hiring’ jewellery for the day. If you have found a designer wedding gown you love, wait until they have a samples sale or a seconds sale and have any sizes or alternations done by a seamstress. Use one of the discount wedding online stores to purchase your gown. 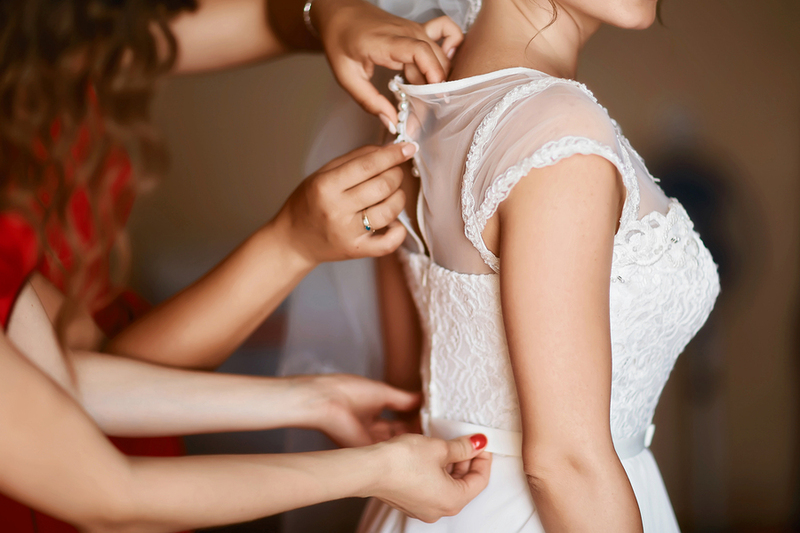 Buy a cheaper style dress overseas and then have a seamstress ensure it fits you perfectly for your big day. Buy a second-hand dress! All the bling without the huge outlay. There are many great websites that offer pre-loved gowns at a fraction of the cost! Hire a wedding dress rather than buying one. Choose shoes that you will wear again! 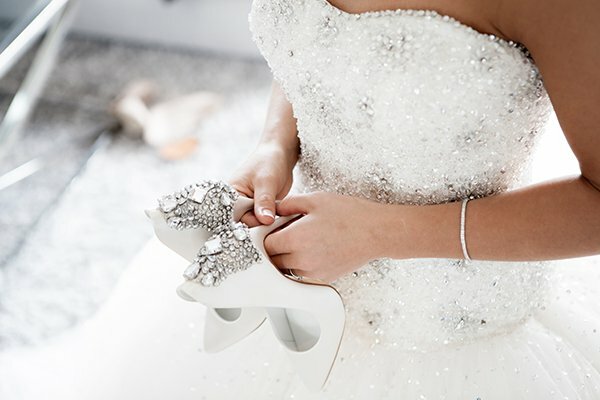 Silver or metallic options will go well with most wedding gowns, and can be worn again for any dressy outfit. Instead of buying ‘wedding shoes’ consider buying a set of beautiful brooches you can attach to a pair of shoes you already own and love. Don’t schedule your wedding on a Saturday. Saturday is peak time for weddings. Instead, wait for a public holiday and have the wedding on a Friday or Sunday. Even better, a mid-week wedding can be a great way to have a brilliant day at up to 2/3 cheaper than a Saturday wedding. Spring and Autumn are the peak wedding seasons. Instead, consider a hot Summer wedding or cold Winter wedding. Consider getting married at Easter or Christmas time. It is easier for guests to have the time off to travel – plus most places are decorated which will save you on decoration costs. Share the decoration cost. If you have a friend that has been married recently or can find out who is getting married just before you, why not go halves in the decorations for both weddings? Pick a beautiful venue so you don’t need to spend a fortune on decorations. Use the bride’s and bridesmaid’s floral bouquets as table decorations at the reception. Grow your own flowers or go to a flower farm. If you have a good head start on your wedding (say a year from now) – find a friend or family member with a green thumb and have them grow the flowers for you. Providing you choose flowers that are in season during your wedding, this is a great way to save lots of dollars. Alternatively, go to a flower farm and organise the flowers directly. If you have more friends that are good at putting together a bouquet – have them do bouquet the morning of the wedding – or negotiate a florist to do the arrangements with the provided flowers. Use the bridesmaid’s bouquets as reception table decorations. Order flowers through your local supermarket. They often have them so much cheaper than a florist – and are only willing to help if they can order in advance. Look at non-traditional wedding bouquet ideas! 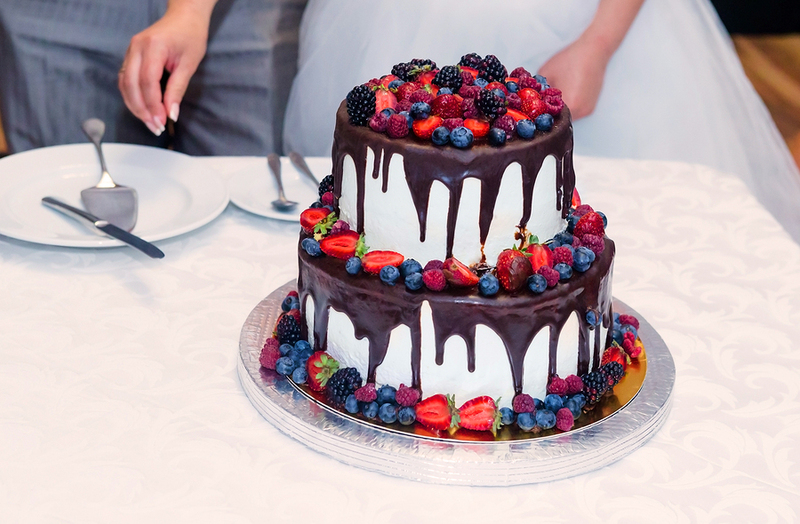 Use your wedding cake as dessert and serve slices with ice-cream or custard and cream. Make your own wedding cake. If you are a great baker, you can bake your own wedding cake – and have a friend that is good at decorating to whip up a simple icing and decorate with flowers. Have a smaller sized wedding cake and have large plainly iced cakes in the kitchen ready to be cut up. If you have your heart set on a large wedding cake, have fake layers made up and only cut the top cake! Have bulk cakes in the kitchen. 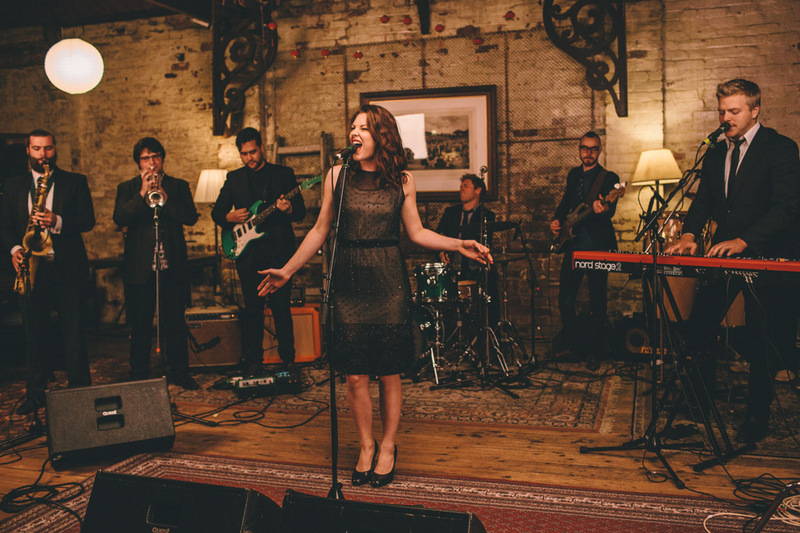 There are plenty of options when it comes to entertainment at a wedding. You could choose a band, just play music from a set play list, or do something crazy like hiring a jumping castle or a dance instructor! Hire a student band rather than a professional band which is very expensive. DJs can play at both the ceremony and reception and are so much cheaper than a band. Plus you can hand-pick your own playlist beforehand to make sure you get to hear all your favourite tunes on the night. Put a disposable camera on each table rather than hiring an expensive photo-booth. Just set up your iPad with good speakers and put on Spotify. Don’t bother with wedding favors. Most people don’t expect them or will just chuck them out anyway. Put the extra money into what really counts, the food or the honeymoon. Get married at the end of the wedding season or during the off-season for weddings to save money and get discounts. Rent a restaurant for the reception including venue and catering. 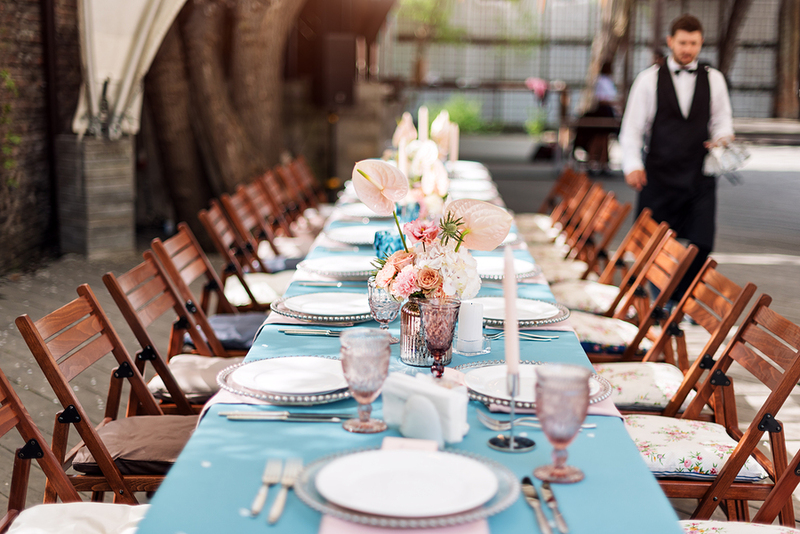 Have larger wedding tables at the reception so you need fewer decorations. Save on your menus with one large board with the food listed items. Hire a couple of food trucks rather than a caterer. Food trucks are very trendy at the moment and you can have a few different types of cuisine – and even a dessert truck! Approach your local Country Women’s Association or similar to cater the wedding for you. If you have a Hospitality Campus nearby, see if they would be keen, students can use your wedding to learn how to plan, cook etc. Have a buffet dinner rather than a sit down catered meal. You will save a fortune on hiring staff, and you usually get more food than you would for a sit-down meal. It also solves the problem on people ‘fighting’ over the chicken or the beef. Banquets are another great idea, similar to a buffet dinner. 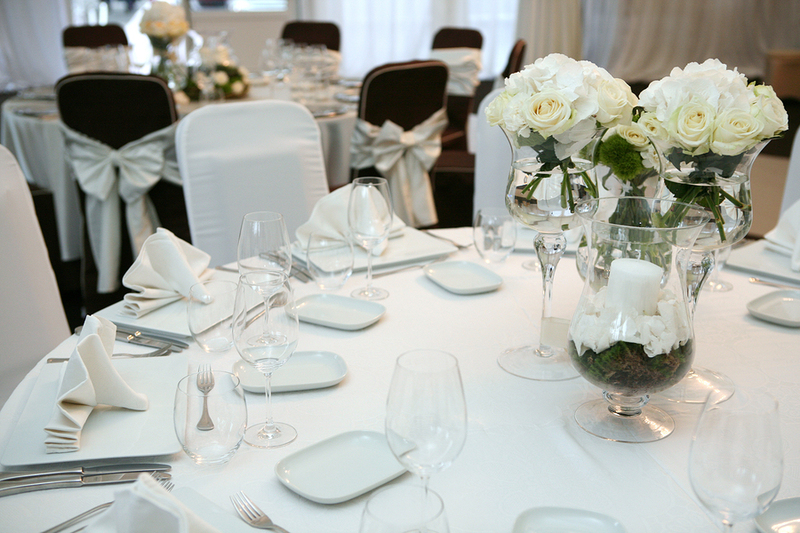 Have your reception at a small restaurant – you don’t need to pay a venue fee PLUS food costs. Plus they will usually let you decorate it for free. Have a cocktail party instead of a sit-down dinner and just serve finger food. 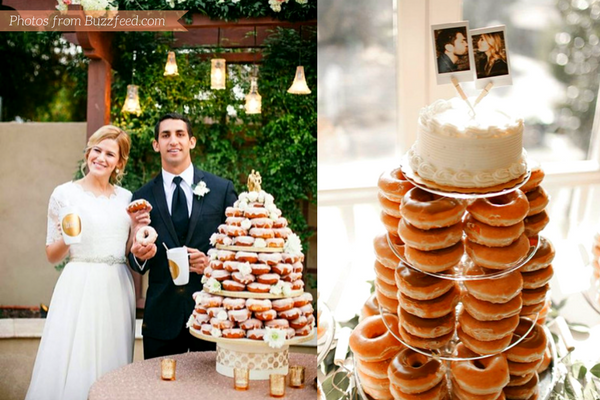 If you have an afternoon or mid-morning wedding, have a morning tea or afternoon tea wedding. You can serve fancy sandwiches and finger food instead. Have a ‘pig on a spit’ or similar and serve the meat with salads. It is still fancy and delicious – and a lot cheaper than individual meals. There are many ‘Roasts on the Go’ type of businesses now that will cook roasts on site and will serve with salads and desserts for a set amount per head. Hire a Pizza Oven for the night. Many alcohol provider websites now offer great deals on bulk wine packages. Wait until you see these prices and keep money aside just for this. Pick up as many as you can afford in the months leading up to the wedding. Keep them in storage until the wedding. Any unused cartons can usually be returned for a refund. Offer selected house beer and wine. Instead of offering a full bar, offer just selected house beer and wine and perhaps come up with a signature cocktail for the night (then use this cocktail for the toast of the night – saving money on champagne!). Have a BYO wedding and don’t provide alcohol at all! Grab a keg of beer! Have a ticket system for drinks at the bar. Include say three tickets on entry into the reception so guests know they can have three alcoholic beverages, and anything else on top of that is up to them to pay for. Ask guests to BYO alcohol to the wedding reception. Stick to simple wine and beer. Stock up on catalogue discounted alcohol over the seasons leading up to the wedding date. Offer one signature cocktail for the night at the reception from the bar. Keep the open bar time limited. Issue drink vouchers – and limit them to 2 – 3 drinks per person. Use short glasses to sparingly hand out the alcohol. 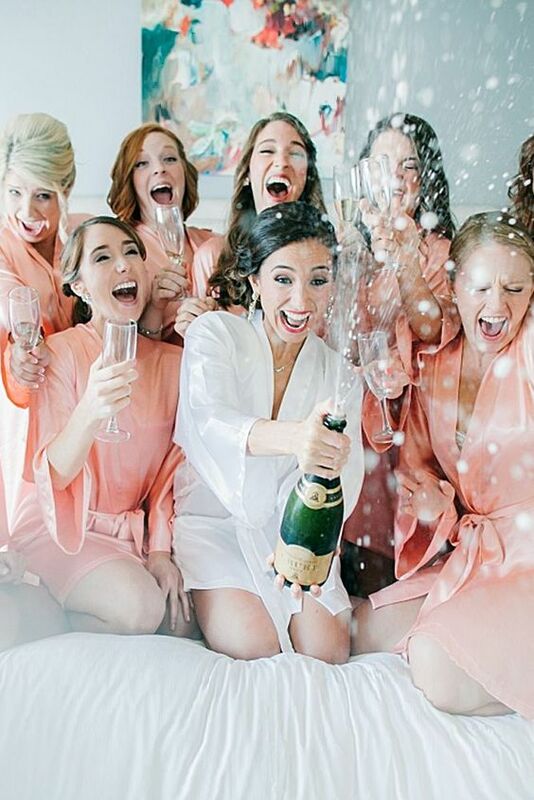 Use the cheap champagnes for general drinks throughout the event. Hand out only a bottle of wine for each table to share for dinner or food given. Possibly have a wedding without alcohol at all and offer juices, soft drinks etc. Have a ‘Signature Drink’ for your wedding and serve this instead of having an open bar. Enjoy a morning or daytime wedding instead of at night when most people are more inclined to have a drink with dinner and for celebrations. 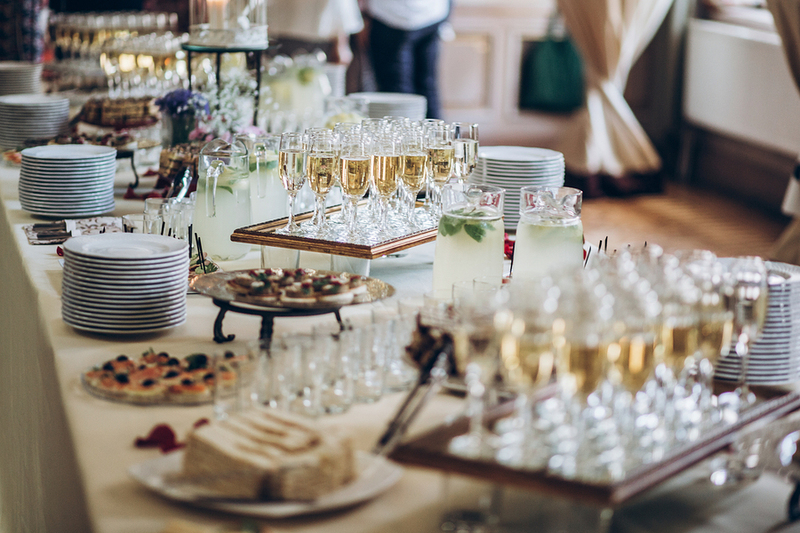 Have a small guest list so less alcohol needs to be served throughout the wedding event. Only offer alcohol for the speeches, toasts or just for dinner. Buy cheaper branded mixes instead of big company soft drink labelled bottles. 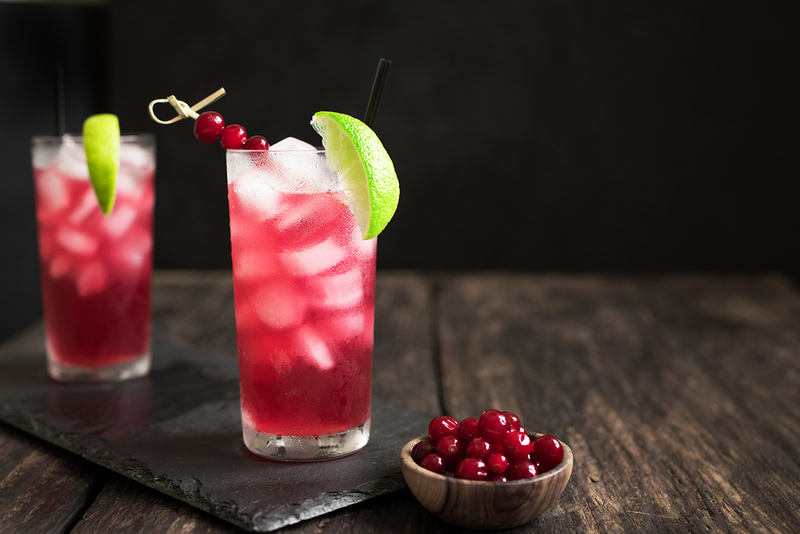 A signature drink is a great way to impress your guests and limit the alcohol. Sell as many of the decorations as you can online or to brides-to-be. Sell off your used wedding table cloths and tables/chairs. Sell bridesmaid dresses and other outfits bought for the wedding. Stay simple with the honey moon. Quality time doesn’t have to be expensive. Sell off any left over alcohol that you know longer need or want. Sell your wedding dress. Some ladies don’t keep them forever. Or donate them. Sell, candles, lanterns or any of the items used at the wedding. Re-sell plates, cutlery and other utensils used for the food from the reception. Re-plant your wedding bouquets (if possible) a great way to utilise those flowers into the garden. Sell your “fake” wedding cake to another couple getting married close to you. Sell all bought bridal accessories from the jewellery worn on the day to items from hen’s night. Print your own wedding photos from your digital package at the cheapest competitive store available. Do you have other tips to save money on your wedding? Share it with us!